Welcome to Garden Bloggers’ Bloom Day for February 2010! 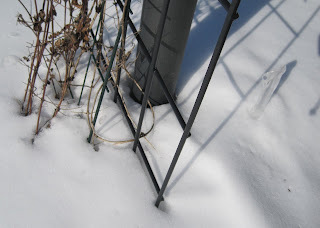 In my USDA Hardiness Zone 5b garden, I find that once again, on the 15th of February the garden is buried in snow. This is how it was for that first bloom day in 2007. But in other years, including 2008 and 2009, I have had blooms outside in mid-February, in this very spot that is currently buried in snow. But this is not one of those other years. This is a new year, a year that so far brings a hodge-podge of indoor blooms and a snow covered garden. Most of the forced bulbs indoors are well past their prime, including hyacinths, amaryllis and paperwhites (Narcissus). This is the last of the Narcissus blooms, hanging on for dear life with a poinsettia still glowing red behind it. I’ll keep watering that poinsettia and then plant it outside this summer in one of the containers for a bit of foliage, but won’t bother trying to bring it back inside in the fall. There are other errant blooms here and there indoors, including still lingering blooms on the Jewel Orchid, Ludisia discolor, a few odd re-blooms on the Christmas cactus, and the ever present pink flowers of the Crown of Thorns, Euphorbia sp. Perhaps the most interesting bloom is on an African violet, Saintpaulia ‘Merlot’. 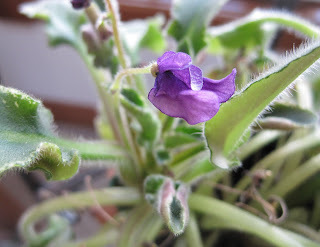 Its blooms do not open like most African violets, but stay closed, making them look almost like a papery pea-type bloom. Thia African violet is also striking for its leaves which are called “bustled”. They are very slightly variegated as well and would be perfect for the Foliage Follow up meme on the 16th hosted by Pam at Digging. Finally, where some snow has melted near a fence, these daffodil sprouts give me hope that I will have blooms outdoors well in time for the next bloom day in March. What’s blooming in your garden? We would love to have you join in for Garden Bloggers’ Bloom Day. It’s easy to participate and all are invited! Just post on your blog about what is blooming in your garden on the 15th of the month and put your name and the url to your post on the Mr. Linky widget below. Then leave a comment to tell us what you have waiting for us to see so we can pay you a virtual visit! My garden is pretty much like yours, but I do have some flowers even if they are inside. How sweet to see your Daffodil sprouts, Carol! I have at least 2 more months of snow. Even when snowed under, you still have more blooms than my California garden! I have nothing for you to see outside save for a lot of snow (and you can see those pics if you like!). Inside, I bought a tiny orchid today - it's precious. I also have some forced bulbs blooming and all dressed up for Chinese New Year. Can't wait to see what you all have going on! Thanks Carol!!! February 15 and one day closer to spring! By next month's Bloom Day, I hope I'll have some good blooms to share, so that I don't have to resort to showing henbit! Your violet is new to me and quite lovely. How lucky to actually see something green in the garden. Even on the south side against our house, we are still snow covered. Well, at least the snow is melting! I'm sure by March, you'll have lots of blooms to share. Thanks for hosting -- again! That bustled African violet is quite interesting. I've never seen that type before. Thanks for the mention of Foliage Follow-Up, and I hope you'll join in on the 16th. Thanks as usual for hosting! Merlot is a striking African violet, made even more striking by its contrast of green and violet against what you still have outdoors. That African Violet is really cool, the bloom almost looks like a sweet pea. Can't wait to see your daffodils, they don't naturalize here. What a cool African violet! Happy GBBD! Hi Carol, gorgeous African violets! When you posted the mysterious photo in your previous post I thought it was some kind of legume and was wondering what kind of legume was grown as an indoor plant. Now it makes a lot more sense! Snap! Like yourself, I had to look indoors for some colour, even though our snow has gone. Quite a difference with twelve months ago. Looks like you could cross country ski in the garden. I'm kind of jealous, actually. I love this idea Carol - it really makes people appreciate the small details and the little plants that bloom at unusual times that often go unnoticed! Its Summer down here in Australia, so there are plenty of things in bloom here at the moment. I've posted a collage of the ones I like the best, though some aren't grown to be ornamentals at all! Sleepy African violets! Here they look quite different. Thanks for hosting - nice to see daffodil shoots in February! Scans are back. Thanks for hosting, Carol. Hi Carol, Happy Bloomdayversary! It was your brilliant idea to have people share their blooms on the fifteenth of each month that inspired me to join the blogging world. As you say, this is not one of those warmer Febs, but we love a challenge! It's a good thing I did not have to rely on indoor blooms for my GBBD post, as I have none. I barely had anything to show form the garden. I know people like you who live in cooler climates develop coping strategies to deal with the winter weather, but down here I am having a hard time. I will be so glad when this winter is over. Here is hoping both of us will have more outdoor color to show next month. Thank you once again for hosting. The paperwhites are looking great, i am sure the scent will be intoxicating. African violet is a tough perennial in our climate, and it is a pleasure to see it blooming. My garden is covered with snow too Carol. I only have a few measly snowdrops blooming. I was literally worried about a February Bloom Day-- nothing will be in bloom I thought! Boy, was I wrong. 3 pix at the blog and about made it into my flickr Bloom Day set. As always Carol, you, May Dreams and Bloom Day are a beacon in the dark! Sorry you're garden's not blooming for you this year, Carol. Thank goodness you've got indoor backup! Carol, Been enjoying your site this winter and I was so happy to finally have something blooming my garden I had to share. I wish I had the thumb for violets. Thank you for all these years of hosting GBBD. My guess of Streptocarpus was off, but it was at least in the same family. Lovely Violet. I do have blossoms on Bloom Day, February is so Fickle but her flowers are tough. We even had a little snow on the 12th. Happy Bloom Day anniversary, Carol. It's been fun joining each and every one since it started. I have my post up. With three+ feet of snow on the ground here, I didn't even try to find any blooms in my yard. I went where I go when I really need a flower hit - Longwood Gardens Conservancy. Now we're talking blooms! I can echo Gail's comment. Not much here. I have a couple indoor things. Last year we had a lot more to show, maybe next month will be better! How exciting to see those daffodils popping through! I doubt there are any daffodil shoots here, but if there were, they would be covered in snow again. We just have to hang on till March! Funky African Violet! I used to have some mini AVs in 1-inch pots on the windowsill. Wonder if they still sell those? Mine is a no-bloom day post, once again. I may try to gently uncover a daffodil bud or two from the snow, just to reassure myself that they're still there. Not much to show -- mostly I am annoyed that my forced bulbs are not cooperating -- they seem to bloom any time EXCEPT for the 15th of the month. I know you're itching to garden but I do love that snow! We missed all the north Texas fun. But your indoor blooms are so beautiful. 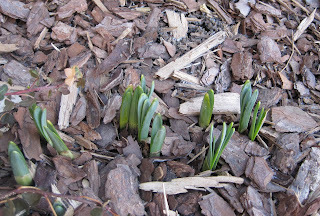 And our bulbs are just peeking up now too so we'll all have lots next time. Carol, I only wish I had the joy of seeing daffodils sprouting in my garden - at this moment I'd be thrilled with seeing some bare earth!!! Thanks for sharing, it gives me hope! Like you, we had several mild winters, which have led us to greater expectations in the garden. This year was a valuable lesson for our southern gardens. It is nice to see your indoor plants in bloom. They must fill the air with spring perfume. Happy Bloom day Carol. I love seeing your 'real' green coming up out in your garden. Thanks again for hosting this fun event. Happy Bloom Day to you carol! Although my garden is snowcovered too, I did find three blooming species today. Happy Garden Blogger's Bloom Day!!! Nothing outside but you can always count on African Violets (and Orchids) when there's snow outside. My Helleborus are in full bloom! They're still young so I don't have many blooms but I'll take what I can get! I also have a Euphorbia and Candytuft trying to bloom. Thanks for starting the Bloom Day posts - I enjoy looking back at prior months and seeing the progress. You certainly have a different February this year than last! But at least you do indeed have flowers almost every month of the year! The flower on the African Violet looks very much like a Sweet Pea, that's what I thought it was before I really looked at the picture. Even with all of your snow your daffodils look about the same as mine here, the tete-a-tetes are early but the others are just poking through. It seems like it's been a very strange winter for everyone this year. I have rosemary, sweetbox, camellias and a manzanita blooming, but I cheated: I have two bloomers I just bought at the YG&P show here in Portland this weekend. They are wonderful, however! I don't have the snow cover...but nearly nada going on in my yard...what a winter! Wow, you certainly have created quite the phenomenon with your bloom day. I'm still new to the blog world (obviously) but will remember for next month. Where in Indiana are you? I grew up in Shelbyville. I'm pretty sure they are buried under snow right now. Hi Carol, your violets are pretty. They do look like sweet peas. Not much going on in my space due to construction. So I've included images of blooming trees from across the region. That African Violet of yours is really interesting. You also may be interested to know that because of all of your indoor plants you have a lot more in bloom than this Southerner does today! Happy Bloom Day! This month is the fourth anniversary edition, n'est-pas? Happy Anniversary! what an interesting african violet! i always enjoy gbbd - i'm glad you came up with it! I keep meaning to force bulbs indoors, and your end-of-season narcissus remind me of that resolution (next year!). Looks lovely against the red. There should be daffodils in bloom now, but it's been very cold, and we've had snow, and they are only a few centimeters above ground. Violets are the February theme and aren't they also this month's birth flower?! Your daffodil sprouts must feel a heavenly shade of green against the snow. Here in the Texas Hill Country, a scattering of warm days liberates butterflies to our winter blooms, a reminder that every day leads to the next, winter into spring. Thanks to you Carol, especially in February, for giving us a reason to look closely and discover hidden treasures. How wonderful to see your daffodils coming up. Hi there Carol. Aw... you've still snow! We're lucky ours has gone for the moment but few blooms here too. Great idea! I just learned about bloom day about 5 minutes ago. I'll definitely participate. I like how the red poinsettia is "glowing" red behind the paperwhites. Years ago, I planted my poinsettia outside and it grew huge and beautiful. Thanks again for hosting this special day of the month. February's usually such a dreary month so it's nice to see so many beautiful plants in bloom. Thanks for giving us a little color this month! Carol, This is the second month I've participated and I have to say it's really fun to walk around the Winter garden and search for bloom, any bloom. Next month will be sooo much easier - thanks for hosting this! This is my VERY FIRST Bloom Day!!! Woo Hoo!! Thanks so much for hosting such a fun event! It's really nice to see everyone's gardens, especially in February! 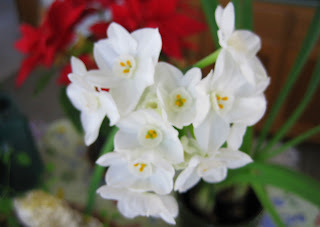 I like your paperwhites...thank God we can enjoy blooms inside when the weather if frightful outside! My post is up with the few flowers we have now blooming. It will be interesting to see what is blooming elsewhere. Carol, what a turn out for February BLoom Day! We are all getting desperate to see some green and something blooming. Your violet is charming-I haven't seen one like that. Will have to look for one. I love the 'sweetpea' look. Thanks for another great hosting of GBBD! This is my first winter forcing bulbs and mine are just getting started. My zone 5b is also snow covered. I almost took some outdoor photos for bloom day, but wimped out and did it out of the window, and they didn't turn out, so I just put some indoor blooms. I like your African violet that is different, by the way. Oh Carol. Oh woe is me. I am still stuck in Siberia and have not even a snowdrop to see. Love the abstract snow photo, Carol. And that African violet is precious. My mother always has them, but I haven't had much luck with them -- maybe I should try again. Happy GBBD! Thanks for the incentive to record my garden. Just like last year, I have flowering quince and daffs. The Chasmanthe also just popped open! We have had a cold winter this year, too. My flowers are all a bit behind, but I have a few things blooming and at least we are not buried in snow! I doubt if I'll have any outdoor blooms by mid-March, Carol. I'm amazed that you expect to in your zone 5 garden. Maybe the "b" makes the difference. My paperwhites are just sitting in the pot doing nothing, except for one, which has finally started pointing up instead of sideways. I've never had paperwhites not grow before. It's wierd. Your African Violet is such a delicate, pretty thing. It's still the 15th in California! :-) Here's my post - Garden Bloggers' Bloom Day - February 2010 - with every single plant I've got blooming! That is a very funky African Violet, I love the second shot of it. The daffodil sprouts are such an encouraging sight. I almost missed GBBD, but better late than never. Congrats on three years of what is now a garden bloggers institution. I've never seen an African violet like yours - too cool. I'll have to add that to my list of wants. Though I'll have to give it to my Mom - she's the only one of us who can get them to bloom. Thanks as always for hosting - it's a big one - or am I just late? Many people really enjoy gardening.In this post, i am sure that they will learn new things that they can apply on their garden. That violet is absolutely cool! Are the cultural requirements the same? Very different....I think I need to find one :) My landscape looks like yours right now, minus all the pretty bulbs indoors. Garden planning is a nice diversion, at least. Bloom Day has been running for three years already - amazing! I'm late again but do have a few flowers. 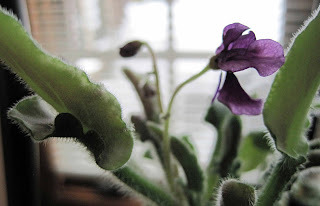 How cool that you still managed to come up with something new in the middle of an Indiana winter... the African violet does have a charming Sweet Pea shape. Did you google "Saintpaulia Merlot"? It was funny to see reviews for a 2007 wine of the same name... wonder whether the name for bottles or blooms came first? Thanks for hosting Garden Bloggers' Bloom Day! I've only participated a couple of times, but enjoy visiting your blog and others around the globe, thanks to GBBD. Your paperwhites are so lovely...I can virtually smell them! Hmmm, good. Carol - Many congratulations on the success of your bloom days posts - to be starting your 4th year of them is a fantastic achievement. I am amazed how far your daffodils have sprouted with the cold winter you have had and I look forward to seeing them blooming away next month. what a great idea! I just started my blog so that I could remember from year to year what is blooming when and what birds are visiting my yard.Here's my bloom (a week late but I just found your blog today! ), a Texas Mountain Laurel.